The current date will be used for positioning the feed on the time line. A data field from the application can be selected. A date stored in this data field will be used to determine the positioning on the time line. If a new data record is saved, a post is created. Here, it makes no difference whether the "Current date" option or the CreationDate data field is selected. If a data record is saved that already existed before the plugin was created, the post will either be sorted by the current save date (at the top) or by the creation date of the data record (usually lower in the table), depending on the settings. 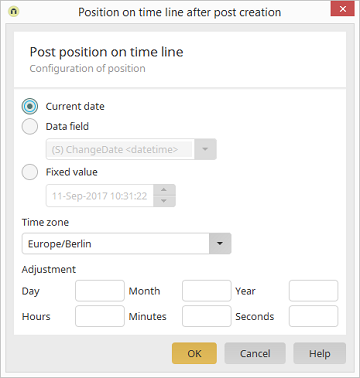 If a post already exists when the plugin is created, the post will be moved to the top with "Current date", whereas selecting the data field CreationDate will move the post visually but it will actually stay in the same place because the post's creation date has not changed. With this option, a static date can be entered, and this will be used for positioning the feed on the time line. Here you can select the relevant time zone. For the first two options, a date adjustment can be defined at the bottom of the window.